The Genesee County Sheriff’s Office has now made accident reports available online at http://geneseecsony.policereports.us/ or by clicking on the link from the Sheriff’s Office home page http://www.co.genesee.ny.us/departments/sheriff/index.html or from the Sheriff’s Office records page. Reports can be searched by date of accident, driver or registered owner’s last name, or the accident report number. Downloads are available in pdf or tiff format and cost $10 each. Reports will be uploaded to the site within approximately five business days from the date of the accident. Payment can be made through the secure site with a credit card or by contacting PoliceReports.US at 1-800-489-0190 to see if you qualify for a prepaid account. This service will save time and make the accident report process more efficient. It is available 24/7 and allows immediate access to the report once it is uploaded. Accident reports can still be acquired by contacting the Genesee County Sheriff’s Office Records Division directly by phone at 585-345-3000, ext. 3560; by fax at 585-345-3089; in person or by mail to Genesee County Sheriff’s Office -- Records Division, 165 Park Road, Batavia, New York 14020; but this is now the preferred method of accident report distribution. posted by Howard B. Owens in crime, genesee county, Sheriff's Office. The Sheriff's Office plan to convert a jailed drug dealer's car into cash hit a road block Wednesday in the Ways and Means Committee. A resolution authorizing the Sheriff to auction off the 2005 Chevy truck passed the Public Service Committee on Tuesday, but Wednesday, Legislator Ray Cianfrini had new information on the state law governing the disposal of seized assets. Cianfrini said he wasn't concerned about the Sheriff's Office getting the money, just that proper procedures be in place and that the law is followed. "I think there needs to be something more speicific and there needs to be more clarification," Cianfrini said. "I don’t have any trouble with the vehicle going to the Sheriff’s Office for law enforcement purposes, but what about the dispersal (of the proceeds)?" County Attorney Charles Zambito provided Cianfrini with a copy of the state law, which outlines procedures and proper dispersal of any revenue generated by the sale of seized assets. The law is complex with multiple variables, and while the Sheriff's Office could wind up with some or all of the revenue generated by the sale of the truck, so could the District Attorney's Office, or the state, or the county. The vehicle was signed over by Matthew Zon, who entered a guilty plea to criminal possession of a controlled substance, 2nd, and was sentenced to prison for possessing and distributing methamphetamine. Undersheriff William Sheron said that since the vehicle wasn't seized, but signed over to the Sheriff's Office by the defendant as part of a plea deal, the procedures outlined in the law didn't necessarily apply. "You’re looking at a state forfeiture process that if (a defendant) were reluctant in turning over a vehicle to us, then we would go through this process to seize the vehicle," Sheron said. "It’s now a common practice, as part of a plea bargain, where (the defendant) signs over title of the vehicle to relieve us from going through this process." Zambito pointed out that even in the plea agreement, the vehicle is signed over "pursuant" to state law, which means, he believes, the process for disposal of the asset is governed by the law. "We still have to follow the rules about what you do with the property once you get it," Zambito said. The resolution on disposition of the vehicle was tabled until the matter can be further researched and clarified. posted by Howard B. Owens in crime, byron, Sheriff's Office. A 2005 Chevy pickup truck taken by the Genesee County Sheriff's Office as part of the plea deal of a confessed meth dealer will be sold as surplus equipment. The truck requires at least $2,500 in repairs making it unsuitable for the Sheriff's Office use. The Public Service Committee today approved a resolution authorizing sale of the truck, but not without some questioning by committee Chairman Ray Cianfrini about why the truck was considered Sheriff's Office property in the first place. He thought it would be county property. Undersheriff William Sheron explained that under state and federal drug seizure rules, property taken as the fruits of drug dealing must be used for law enforcement purposes. So placing the title of the vehicle under a law enforcement agency's name helps provide proof the vehicle isn't being used for other purposes. Any proceeds from the sale of the truck will go to the county treasurer, but can only be spent on law enforcement purposes. Both Le Roy Police and Batavia Police, as members of the Local Drug Enforcement Task Force, share in the proceeds of drug seizures, Sheron said, but typically, the funds are used for equipment or other task force costs. While the money can't be spent on anything other than a law enforcement purpose, any expenditure must be approved by the Genesee County Legislature. The truck seizure was part of a plea agreement for Matthew Zon, who entered a guilty plea July 26 to criminal possession of a controlled substance, 2nd. Zon was sentenced to three years in prison and forfeiture of his truck. While local law enforcement has been involved in a few drug property seizures over the years, the largest may have been in about 1988, Sheron said, when a drug dealer's house in Batavia was taken. The eventual sale of the house netted local law enforcement about $150,000. Sheron also noted that the forfeiture law has changed a lot over the years. "They've definitely raised the bar," Sheron said. "It used to be if you found a roach in a car, the car could be taken. That's all changed now. It takes a case of trafficking." When Deputy Brian Skelton shows up for work Friday, it won't be to sit in a courtroom and listen to lawyers haggle over the fine point of some law, or tell one more man to empty his pockets before walking through the security scanner or help some inmate into the courtroom. Rather, Friday is the day Skelton turns in his gun and badge, signs a few papers and closes out a 32-year career in the Sheriff's Office. "It was just time to go," Skelton said. He has no particular plans for retirement, except to spend more time with his family and play a little more golf. He might look for another job, but first, he's just going to take some time off. Skelton is the first sworn officer in the department to retire since Sgt. Gary Russell in 2007. Sheriff Gary Maha said there are currently several members of the department eligible to retire, but nobody has made an official announcement. Maha's staff is currently interviewing candidates for Skelton's position in the courthouse and once he's replaced, that could lead to an opening for the Sheriff's Office to hire a new deputy. The security staff at the courthouse is paid for the NYS Office of Court Administration. Skelton has been assigned to court security since 1997, which is when the new courthouse opened. He began his law enforcement career in 1980 working security for Genesee Community College. He was hired by the Sheriff's Office as a corrections officer at the jail in 1983. After 18 months of employment at the jail, he was admitted into road patrol school and worked the roads of Genesee County from 1985 to 1997. One night during those 12 years on the road -- this was about 20 years ago -- Skelton and his partner came across one of the two big murder cases Skelton was involved with during his career. Skelton and his partner that night, Deputy Eric Koziarski, who was still in training, were cruising in Darien when they came across an 18-wheeler pulled over to the side of the road and the driver trying to put up cones. When Skelton and Koziarski approached the driver, it was immediately apparent that the man -- whose name Skelton doesn't remember -- was intoxicated. Koziarski noticed a shell casing on the roadway. Skelton noticed some blood under the door of the sleeper cabin and the door was slightly ajar. When the deputies opened the door, there was a man laying inside with a gunshot wound to his head. The victim was still alive, but died the next day. The murderer was apparently getting ready to dump the body in a ditch near the road. "The Sheriff at the time told me that if we hadn't come along when we did, it probably would have gone down as another unsolved murder," Skelton said. "The two men were both from out of the area, they didn't know each other before meeting at a truck stop that night, and the trucker would have been long gone before we found the body." The other murder case where Skelton showed up at the right place at the right time involved a group of traveling magazine sales reps.
Skelton was dispatched to what is now the Clarion Hotel where a woman wanted to file a complaint about a possible assault. While Skelton was talking with the woman, the two suspects showed up and she said, "there they are." The two young men took off running. Skelton was able to tackle one and the other was eventually captured on the grounds of the VA Hospital. It would be another half day before the bodies of the victims were found, dumped in a quarry off Seven Springs Road. It turned out that the group had cooked up a plan to rob the gas station at the corner of Cedar and Ellicott streets. When two of the members of the group decided to back out, the other two young men decided to bash their heads in with rocks for fear the other two guys might snitch. Both killers were eventually given sentences of life without parole. Being in the right place at the right time figured prominently in other cases Skelton helped crack, such as the time in Alexander he came across a truck pulled over on Sandpit Road with a stolen riding mower in the bed, or the stolen vehicle he stopped for a traffic violation, only to notice broken glass and the ignition was punched out (the car, stolen out of Buffalo, hadn't even been reported missing yet). The driver, it turned out, was wanted on an arson warrant. But even with the excitement of road patrol, when there was an opportunity to move to court security, it seemed like a good deal, Skelton said. Court security means all day shifts with weekends and holidays off. Not that it's all a bed of roses in the courthouse. Not everybody appreciates or understands the need for secuirty and they will complain about emptying their pockets, going through the scanner, getting bags and briefcases scanned, and are just some times unhappy with being summoned to court at all. "It can be trying and get on your nerves at times," Skelton said. While defendants and people in the gallery can get unruly in court at times, Skelton said he doesn't remember ever needing to wrestle anybody to the ground or make an arrest. But working in the court house, seeing some cases from beginning to end, has been an eye-opener about how the legal process works, something he thinks all police officers would benefit from seeing. "It's a lot different from being on the road," Skelton said. "Lawyers have 45 days just to file motions on their clients' behalf, so they have a lot of time to look into a case, where a lot of times, a police officer doesn't have a lot of time before making an arrest. "(Officers should) come in and listen to a case from start to finish for a jury trial," Skelton said. "It opened my eyes quite a bit. I remember stuff I used to do on the road and in investigating cases and not worrying, say, about little things, and later those little things become big things in the case." Deputy Timothy G. Wescott was named Officer of the Year by the Genesee County Sheriff's Office during the department's annual awards luncheon at the office on Park Road, Batavia. Senior Emergency Services Dispatcher James E. Tripp received the Distinguished Service Award. During the luncheon, dozen of other honors were handed out for time in service, distinguished service and meritorious service. For the complete press release along with more pictures, click on the headline. Pictures from the event can be purchased by clicking here. Sheriff Gary Maha told the Ways and Means Committee today that for new detective vehicles, nothing else but full-size sedans will really do. Those smaller cars aren’t made to hold up under our driving conditions," Maha said. "They’re not made for police work." Maha also said smaller sedans are less safe and detectives need all the trunk space of a full-sized sedan. Highway Superintendent Tim Hens had presented bids for the county to buy three new sedans for detectives at Tuesday's Public Service Committee meeting and questioned were raised about the expense of big cars. Maha appeared before the Ways and Means Committee today to explain the need for them. Hens also came with additional information on the purchase. It turns out, stepping down from a Chevy Impala to a Malibu would save only $200 per car. That's because the GM fleet discount for Impalas is more than $1,000 greater for the bigger car. There also wouldn't be a significant savings on gas, with the Malibu rated at 34 miles per gallon highway and the Impalas getting 29 mpg. "If the different was a $1,000 I’d tell you to cram the stuff into the smaller trunk, but for $200, I’m more than happy to pay that," Legislator Jay Grasso said. Maha said a typical detective carries in his trunk a shovel, muck boots, an arson kit, a DNA kit, camera equipment, a fingerprint kit, a crime scene kit, the hardware for the car's communications and computer-related supplies. The lowest bid for the Impalas, at $20,010 per car, came from Ken Barrett Chevrolet in Batavia. posted by Howard B. Owens in batavia, Sheriff's Office, Genesee County Jail. Investigators have yet to determine the cause of death of 42-year-old Nikko C. Gambino, an inmate of the Genesee County Jail, who died Friday after being transported to UMMC. Gambino was reportedly going through withdrawals from drugs and suffered various other medical issues, according to Sheriff Gary Maha. Medical examiners have yet to determine the cause of death and are conducting an autopsy. Gambino most recently made news locally after he was caught allegedly smuggling drugs into the jail. In that case, the search warrant was executed at UMMC, where Gambino reportedly had to pass the drugs before they could be recovered. At the time, the Covington resident was serving an intermittent jail sentence for impersonating a federal law enforcement officer. In a press release, Maha said Gambino was being closely monitored by corrections officers and medical personnel because of his health issues. On Friday, at 2:12 p.m., a corrections officer spoke with Gambino who reportedly motioned he was OK. At 2:26 p.m., an officer making his rounds "noticed that Mr. Gambino wasn't doing well," Maha said. The officer summoned assistance and another corrections officer administered CPR. Gambino was transported to UMMC by Mercy EMS. He was pronounced dead at the hospital at 3:05 p.m.
As required by regulations, the NYS Commission of Corrections was notified immediately of Gambino's death. The commission will conduct its own investigation, as required by law. There is no sign of foul play, Maha said. Deputy Tim Wescott spent a few hours at Target on Saturday creating ID cards for children. The session includes getting their weight and height, getting fingerprints and snapping a picture. The parents receive (within seconds) a plastic, driver's license type of card with the identifying information of their children. The information is kept on file by the Sheriff's Office should it ever be needed to help identify the child in a crisis. Wescott and other members of the Sheriff's Office have been out at many community events providing the ID service. Wescott said being in a retail store was the first time they had tried it in such location and he said the first couple of hours were pretty busy. posted by Howard B. Owens in crime, K-9, Sheriff's Office, Brian Thompson. Deputy Brian Thompson's new partner has convinced him to keep working a couple of years longer. Thompson was considering retirement in December, but then "Pharoah" came into his life. The 8-year-old, 80 pound, Czech Shepherd was donated to the Sheriff's Office by the Niagara Falls PD and handler Michael Bird after K-9 "Finn" was retired due to a medical condition. Thompson has nothing but praise for Pharoah, who he described as a great tracker, good with children and an excellent drug detection dog. "When we get a chance to use him for tracking, we're going to find some bad guys andhopefully find some people who might be missing," Thompson said. Already, Pharoah is making an impact in the fight against illegal drugs in Genesee County, according to Thompson. "He's had some awesome drug finds so far that led us into some pretty good arrests, in the Class B felony range," Thompson said. "That inspires me." It inspires him, Thompson said, to keep going for the sake of the community. He thinks local law enforcement has been making good progress so far in fighting meth and crack in the community. "Hopefully, some people will be put back on their heels to say, 'I don't want to deal drugs in Genesee County -- they're catching a lot of people there,'" Thompson said. "We can clean this town up. I love this place. It's the greatest place to live in the world." Pharoah is trained to alert on methamphetamine, cocaine, heroin, marijuana, hashish and ecstasy. He is also trained to track human scents, both in the open and in confined areas, and trained for handler protection and criminal apprehension. The K-9 program's vet bills, medications and non-handler kenneling are paid for from a K-9 fund set up with community and business donations, including an original substantial donation by Ken Barrett Chevrolet several years ago. All equipment for the K-9 program also comes from the fund, and when Pharoah retires in a couple of years, a new K-9 will need to be purchased from the fund, which has been dwindling over the years, Thompson said. He said he's confident, when the time comes, the community will come through to offer continued support of the Sheriff's K-9 program. The past year was another busy one for the Genesee County Sheriff's Office, with members of the department handling 21,334 calls for service. While the number of calls for service was down, the overall number of calls to the dispatch center was up, according to Sheriff Gary Maha. Increasingly, Maha said, people are using 9-1-1 or the 343-5000 number to seek all kinds of information and help. When people don't know what to do, who to call, or after business hours for other government agencies, they call the dispatch center. "That's fine," Maha said. "That's what we're here for -- to provide public service." Dispatchers, Maha said, may not be able to help the caller directly, but may be able to point them to the right resource for help. The Sheriff's Office released its 2010 annual report today, which breaks down most of the statistics related to call volume, number of criminal reports, accidents and arrests. In recent times, in a bad economy, the Sheriff's Office has had more and more activity to deal with, Maha said, adding that less money leads to more police activity as well as tighter government budgets. "We haven't asked for any more help," Maha said. "In our current budget situation, I certainly don't want to lay anybody off. That would put the public in jeopardy if I had to lay off any deputies and it would put my own people in jeopardy." Maha said police services remain local government's number one priority. "What kind of quality of life is it if you don't feel safe?" Maha asked. "If you're going to the store at night, or walking down the street, you don't want to worry about getting mugged. What kind of quality of life is that?" More than 1,100 people were booked into Genesee County Jail. The highest single-day population was 99 and the lowest was 35. In all, 70,761 meals were served. Education services were provided to 116 inmates and 11 received GEDs. Inmate medical expenses totaled $204,438. There were 202 DWI arrests. Of those, 50 people age 21-24 were arrested for DWI, and 34 in the 25-29 age bracket. Males were arrested far more frequently than females, at 140 to 62. Saturday is the biggest DWI arrest day at 68 followed by Sunday at 43. Most arrests are between midnight and 3 a.m., with 83 total arrests during those hours. Two people arrested had a BAC of .31 or greater. A total of 43 people had BAC of .18 or greater. There were 27 felony DWI arrests. There were 1,360 motor vehicle accidents handled by the Sheriff's Office. Of those, 202 were personal injury and five were fatal. There were arrests made on 75 felony counts by the Sheriff's Office and 354 misdemeanor charges. Crimes reported: 106 were burglary, 140 were criminal mischief, 155 were harassment, 367 were larceny, 133 were liquor law violations, and 117 were unlawful possession of marijuana. In all, there were 1,680 criminal reports made in 2010. There were 573 domestic incident reports. posted by Howard B. Owens in Sheriff's Office, Dispatch Center. A new system for communicating with emergency dispatch centers is in the works, and architects of the system are looking for feedback on what people with disabilities need, and how they use 9-1-1 systems. Steve Sharpe, director of emergency communication for the Genesee County Sheriff's Office, is asking the people with disabilities in Genesee County take a short survey provided by the Federal Communications Commission on 9-1-1 services. "This is a survey for folks with disabilities to rate their local access to 9-1-1," Sharpe said. "This will help the State of New York better prepare for what is now called Next Generation 9-1-1 or NG911. NG911 is the next step in contacting 9-1-1 centers during emergencies including using technologies such as texting, video and other means. We need our local special needs population to fill out the survey so we can better meet their needs in Genesee County." posted by Howard B. Owens in awards, Sheriff's Office. Deputy Edward Vlack is Officer of the Year in the Genesee County Sheriff's Office. Jane Ferrando received the Distinguished Service Award. Both were honored Friday during the Sheriff's Office annual holiday lunch at the headquarters office on Park Road. Awards were also presented Deputy Patrick Reeves, Deputy Brian Thompson and Sgt. Thomas Sanfratello for Meritorious Service. Commendations were presented to Chief Deputy Jerome Brewster, Deputy Lonnie Nati, Correction Officer Lisa Aratari, Correction Officer Walter Kolmetz and Correction Officer Bob Mattice. Top photo: Vlack receives his award from Undersheriff William Sharon, left, and Sheriff Gary Maha. Genesee County Deputy Sheriff Jason E. Saile was recently honored by the New York State Governor’s Traffic Safety Committee, Mothers Against Drunk Driving (MADD)-New York State and New York State STOP-DWI for his efforts in combating DWI. Deputy Saile was one of 17 local law enforcement officers recognized statewide for outstanding achievements in deterring drunk/impaired driving. During 2009, Deputy Saile made 43 DWI arrests, of which nine were felonies; made 72 criminal arrests and issued 537 traffic tickets. Deputy Saile was presented an Individual Officer Award during the MADD and STOP-DWI Law Enforcement Recognition Awards Event held in Albany, New York on Tuesday, November 16, 2010. Deputy Saile was nominated for this award by Sheriff Gary T. Maha. posted by Howard B. Owens in animals, Sheriff's Office. K-9 "Finn" has tracked his last criminal and is on the verge of becoming somebody's family pet. The 6-year-old police dog suffered a parasite infection in his hip about a year ago and his muscles have yet to regain their full strength. “He’s not going to ever fully recover to the point to be able to do the job of a K-9 police dog,” Sheriff Gary Maha told the Ways and Means Committee on Wednesday. Maha is asking the County Legislature to pass a resolution allowing the Sheriff's Department to donate "Finn" to a person in the community, and then accept -- as a gift from the Niagara Falls PD -- a K-9 about the same age. Deputy Brian Thompson said he will be sorry to see "Finn" go, but with another police dog about to join his household, there just won't be room for "Finn." "It's heartbreaking to me," Thompson said. The new dog, whom Thompson already knows, will be the last K-9 Thompson will work with professionally. After 19 years, going back to his time in the Army, Thompson is stepping aside as a K-9 handler. The Sheriff's Office is already starting the process of finding a new handler. The new handler will get a "green" dog, at a cost of $6,200 to $6,500, plus the cost of at least 16 weeks of training. The Niagara Falls dog is available because its current handler was involved in a shooting and has had trouble returning to work. The dog will be donated to Genesee County. Thompson said the expectation is that the dog will have two or three years of working life left before retirement. Thompson will continue on as a K-9 handler so long as that dog is able to work. Meanwhile, Thompson continues to work with K-9 "Jay," whom Thompson said is "the best narcotics dog I've ever worked with." "Jay" is 13 years old, however, and is no longer physically able to handle chasing suspects or tracking criminals. "Finn" was only on the job for six months when he was out on a detail assisting Niagara Regional Police Services in Canada. Thompson had to take him into a wooded area, and it turned out the area was full of ticks. The ticks were treated and the dog seemed fine at first, but parasites apparently weakened the muscles in his hip. Over the next couple of months, he developed muscle tears while working and training. On one job, it became apparent that "Finn" was in a good deal of pain. He's been out of service for nearly a year. A friend of County Attorney Charles Zambito raises purebred German shepherds and is interested in taking in Finn, but first the woman needs to ensure "Finn" and her other dogs will get along. If that person accepts "Finn," Zambito will need to draft a contract relieving the county of any liability. Both Maha and Thompson, however, said "Finn" would make an excellent family pet. "He’s not a violent dog," Maha said. "He’s a very friendly dog." "Finn" just isn't aggressive at all, said Thompson. "Even in his job, he doesn’t like the aggression part of it," Thompson said. "It’s just not in him. We tried putting it in him with different training and different work, but it’s just not part of his personality. He’s not the least bit interested in harming anybody." If you try to call the Sheriff's Office at 343-5000, you might not get through. The problems with the phone lines this morning is not affecting 9-1-1 at all, according to Undersheriff Bill Sheron. People who need to place non-emergency calls to the Sheriff's Office are asked to call 345-3000 and select and press 0.
posted by Howard B. Owens in genesee county, Sheriff's Office, Dispatch Center. Often times, according to Emergency Communications Director Steven Sharpe, when people call 9-1-1 looking for help in a hurry, they don't understand why the dispatcher starts asking a lot of questions. A father has fallen from a ladder, a grandmother has had a stroke, or a child is seriously ill. The caller has one thought: Get an ambulance here fast! And some dispatcher on the other end of the phone starts asking questions and seems to be taking up a lot of time talking. The caller is thinking: Why can't you just send help now instead of gabbing on the phone? What the caller may not realize, is that the dispatch center is staffed by three or more people who can share information quickly and easily through their computers. While one dispatcher is gathering vital information that will assist emergency responders when they arrive on scene, another dispatcher is already putting out the call to the appropriate agency. posted by Howard B. Owens in Sheriff's Office, Dispatch Center, Steven C. Sharpe. The Genesee County Emergency Dispatch Center is on track to become one of the elite dispatch centers in the state, if not the country, with Director Steven C. Sharpe setting the bar high. 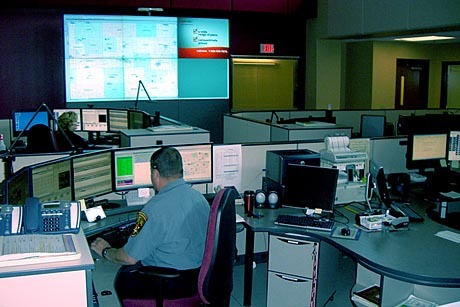 It's Sharpe's goal -- and has been since 2006 -- to have the dispatch center receive an Accredited Center of Excellence rating from the the National Academies of Emergency Dispatch. No New York county has received an ACE rating since Monroe did it 18 years ago. "It’s aggressive, but if you want to be the best and you want to say you’re the best, then you prove it by doing it," Sharpe said. Sharpe, along with dispatchers John Spencer and Beth Hynes-Fisher will attend a training program in Orlando, Fla., in April that will provide the trio with more information on what it takes to win the accreditation as well as training in leadership, educating others and quality assurance. There will also be a series of classes on specific dispatch situations they can take. The accreditation focuses on emergency medical dispatch, but Sharpe said the benefits go beyond sending ambulances out. While achieving the accreditation is something Sharpe set his eye on as far back as 2006, he couldn't have dispatchers focus on the training during the years of moving into a new facility and consolidating with Batavia and Le Roy. Sharpe said his team started concentrating heavily on the accreditation in June and has already achieved a better than 90-percent compliance with protocols and calls. Accreditation requires at least 90-percent compliance on most calls and more than 95 percent on certain types of calls. Part of the procedure required is that dispatchers go through a series of questions with callers in emergency medical situations. It's important for dispatchers to correctly assess the situation so they send the right personnel and ensure the emergency responders are properly prepared for what they might find. "People often ask, 'why am I being asked all these questions?'" Sharpe said. "What we’re trying to do is find out what all the signs and symptoms are, and more importantly, give you instructions so you can help the person who is in need of assistance." He said callers don't often understand that while one dispatcher is conducting the interview, another dispatcher is already starting an ambulance to the scene. Callers sometimes express concern that an ambulance isn't being sent right away, and that usually is not the case. Sharpe joined the Sheriff's Office in December 2005 after eight years in the Air Force working in intelligence. He said his USAF background plays a critical role in how he approaches his job now. "One of the core values of the Air Force is excellence in all we do and this is one of the things I carry over into here," Sharpe said "It’s what we expect of our dispatchers. It’s a very challenging job. It’s a very difficult job. It’s very stressful. But they hold themselves to such a high standard." Dispatch Center photo is a file photo. posted by Howard B. Owens in gensee county, Sheriff's Office. Deputy Ronald E. Meides, right, with Sheriff Gary Maha, was named the Genesee County Sheriff's Office 2009 Officer of the Year today during a luncheon at the department's Park Road facility. The Distinguished Service Award went to Senior Emergency Services Dispatcher Gary D. Diegelman. Pictured left to right below: Steven Sharp announcing the award, Director of Emergency Communications while Undersheriff Bill Sheron, honoree Diegelman, Sheriff Maha and Chief Deputy Gordon Dibble.